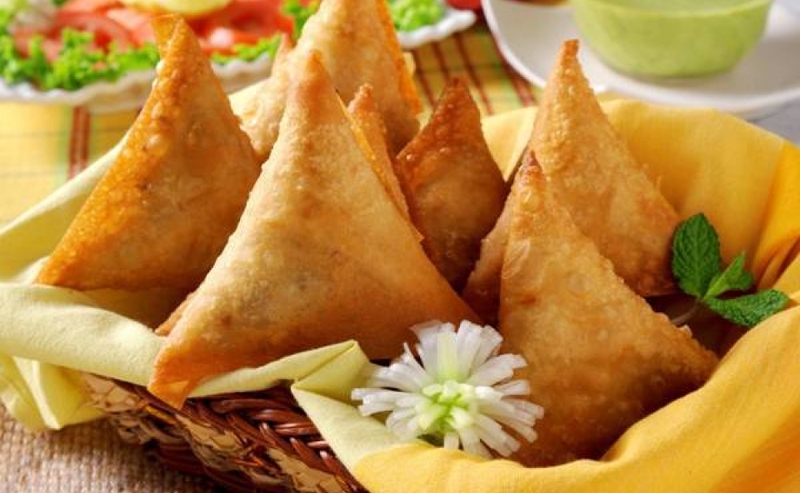 For preparing vegetable samosa, pressure cook the potatoes, green peas and carrots in salt water. Drain the water and smash only the potatoes. In a bowl mix the mashed potatoes, pepper powder, salt, chilly powder, lemon juice, curry leaves, garam masala, green chilles and ginger-garlic paste. Add in the peas, carrots and coriander leaves. Mix well again and keep it aside. Knead a soft dough with maida and salt water. Divide into small balls. Roll out small chapatti`s and fold it into a triangle shape. Place the vegetable mixture in the triangle shape. Apply water on the ends of the chapatti and secure them tightly on all sides. Repeat the procedure with the remaining dough. Heat oil in a deep frying pan and deep fry the samosa¦s until golden brown. Serve hot with chutneys, ketchup, etc.